The innovative and sometimes outrageous creations of 20th century artists frequently prompted the question: “What is art?” but the same question is also a point of contention at the other end of the time line, with the very beginning of human artistic expression. I’ll leave the haggling to the scholars as to whether the engraved lines and forms on bones made by Neanderthals 80,000 years ago constitutes art or is only the first expression of an aesthetic sense and not really art. But there is no question in anyone’s mind, scholar or not, about the artistic merit of the works that suddenly appeared in Europe starting about 34,000 years ago. Neanderthals made finely crafted stone tools and were the first to bury their dead. But our Homo sapiens sapiens ancestors, with their unique and evolutionarily advanced brain frontal lobes, had a capacity for symbolic expression that our Neanderthal cousins never quite achieved. No doubt H. s. sapiens applied their new brain power to a number of challenges but the most startling remnants of their early efforts were their ventures into sculpting, etching, and painting. Until the 1990’s, 'portable art' or carved figurines were the most dramatic and prevalent remains of early art (and then the decorated Chauvet cave was discovered from about the same era). 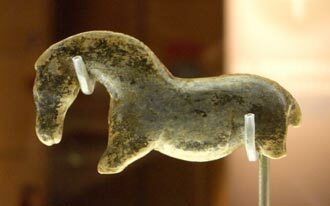 The oldest figurines are about 30,000 years old, are pocket-sized and were often carved from mammoth ivory. The finely detailed though damaged lioness-headed man and tiny horse from Germany are both from that era and despite the unlikely colors, are both of ivory. The next cluster of discoveries was of presumed fertility figurines that early archeologist’s dubbed Venuses, dating from about 25,000 before present (bp). 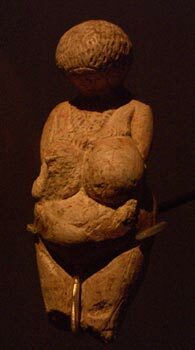 We encountered our first Venus, the Venus of Willendorf, in Austria in 2001. Like the Atapuerca archeological site we visited in Spain this year, this Venus was an accidental finding during excavation for a rail line. She is pretty typical, being about 2” high, extremely plump and faceless, and looks much like the close-up of our photo here of a Russian Venus. Venus of Willendorf was carved from sandstone but many of her several dozen sisters emerged from mammoth ivory. 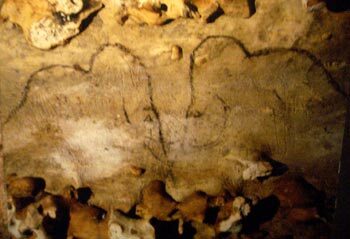 The relatively recently discovered Chauvet cave in eastern France is by far the oldest decorated cave that we know of, dating from about 34,000 bp. Sadly, it never has been open to the public and we’ve been told it never will be. Most of the other decorated caves are less than half that age, dating from around 15,000 bp and all are in Europe. The stunningly painted Altamira cave in northern Spain is also from this era. Animals were boldly and realistically depicted in the caves and often with great anatomical detail. The artist’s were skilled at using the lumps and bumps of the cave walls and ceilings to give the prehistoric animals a sense of volume and sometimes managed convey the impression of movement. The animals drawn often weren’t the everyday ones that were hunted like reindeer and mammoth, but the relatively more exotic species like bison and horses. People were far less frequently drawn in the caves than animals and were always presented in a more “Picasso-esque” or symbolic way. In addition to the many animals and relatively few humans, huge numbers of symbolic or “enigmatic images” were painted in the caves. They are to my eye a very uninteresting assortment of dots, squiggles and squares that were sometimes distractingly placed over the realistic images. The large number of such symbols in all the caves suggests they were very important to the culture spawning them. Almost all the modern researchers are cautious about proposing meanings or specific significance to the images in the painted caves, as there is no way to really know. The spiritual theories are the most compelling, as the art occurs in deep, dark and hidden recesses of caves that aren’t easily accessed. Being places of initiation rights or shaman ceremonies are also popular theories for the drive to decorate the caves. Though very distressing to modern observers, overlapping images are found in almost all the painted caves. Some of the layered images were created simultaneously by a single artist whereas others are presumed to be new works painted over older images. Perhaps it was the making of the image that was important, not the viewed product. Or perhaps certain places in the cave or the contours of the surfaces made them especially auspicious or compelling to use and reuse. Distinctive holes in the walls of some caves suggest that the artists constructed scaffolding to paint the high ceilings whereas other ceilings were so low that the painters crawled on their bellies to access the caves and painted from their backs. (Many of the caves we visited were quite shallow and had been excavated for easier viewing by the public.) Primitive tallow lamps, flint engraving tools and coloring tools of ochre and other minerals have been found in many of the regional caves without paintings, so presumably many more were painted than have survived to our times. Inexplicably, cave painting in Europe suddenly stopped a little over 20,000 years after it began at Chauvet, coinciding with the ending of the last ice age. 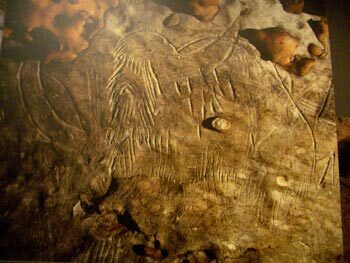 Outdoor art on rock surfaces occurred on all 5 continents, but Upper Paleolithic cave painting was only in Europe and has primarily been found in northern Spain and southern France. That’s a brief review of what we have learned about Upper Paleolithic art in our scramble to visit some of the decorated caves and their associated museums in Western Europe. What follows is the much more chaotic process of how we actually came to this understanding during the French segment of our unscheduled studies. Bordeaux was our staging point for entering the river valleys to its east, which are home to many of France’s decorated caves. There we sorted out if we would need to rent a car to efficiently access the sites (nope), visited our first museum in the area and hoped to gather up additional information about the individual caves and their business hours. Even with 2 guide books, we were having an unusually hard time planning a route and sightseeing strategy that made sense and felt we needed more help. The city of Perigueux (pear-goy), north and east of Bordeaux in southwestern France is the unofficial gateway to one of the concentrations of decorated caves in the country’s Dordogne region. We wanted to kick-off our grand tour of the caves right, so were really looking forward to visiting “…one of France’s best museum’s of prehistory” according to our Lonely Planet guide book. We stopped by the night before to confirm that the museum would indeed be open the next day and to nail down the ever-slippery business hours. We held our breath as we approached it and were relieved to read that the museum would be open despite the network of scaffolding on the exterior. We intended to exhaust our museum attention span of 3 to 4 hours on the exhibits early in the day while we were fresh and would leave the rest of the afternoon free to integrate what we had learned. But sadly, this was to be the third in a string of disappointing museum’s in France this year. Bill had routed us to Bordeaux specifically to see its prehistory museum which was OK but not great. (And that had come on the heels of having dropped over $100 on round trip train tickets to make a day trip to see a museum about the exploration of the New World from the perspective of the European explorers in La Rochelle, only to leave that experience feeling it was a very, very expensive day with little gained from it.) Visiting Perigueux’s museum was like a trip back to an Eastern European museum in the Czech Republic or Croatia that were so sadly neglected by the cash-strapped communists. Our guide book’s author must have trusted the tourist information office literature instead of poking his or her head into the museum for a look. I struggled to read the small print of the token bit of English in one display case where the glass was so old it sagged and made reading difficult through the wavy distortions. Most of the displays inside these ancient cases looked like high school science projects from the 1960’s. Coarse, painted burlap fabric with large nail heads staring back at us made the platform for most of their precious archeological finds. The understanding and dating of evolution has changed a lot in our lifetime and we had no confidence in the dating of much of the information provided in this museum as we didn’t know how many decades-old their perspective was. And Bill is still squirming at the sight of some of the breath-taking, natural crystal points (like arrow heads) that are becoming stained with rust from their display brackets. A little iron wire stand holds each piece and you can see through the crystal to study the radiating pattern of rust that now covers about 1/3 of each crystal item. These items are likely now permanently discolored from the chemical reactions between the iron and crystal and no one is intervening in the destructive process. The only updating of the display cases appears to be the addition of some high intensity light bulbs in a few cases that are damaging the stone blades closest to the lights. On the top shelf of each case lays a mini-explosion pattern of grit around the finely crafted stones—presumably the erosion process of exposure to high heat each day and cooling each night that is greatly accelerating the destruction of these 20,000-100,000 year old finds. And then there are those unattractive little plastic cups and containers that apparently are supposed to be filled with water to stabilize the humidity in the cases. But only a couple of them actually had water and all the others were dry--the plastic encrusted with the mineral deposits from previously evaporated water. Our photo of a museum's photo of a Rouffignac mammoth. Our uninspiring introductory visits to the prehistoric museums in the French cities was completed and at last it was time to visit a real cave--Grotte de Rouffignac (“roof-in-yak”) was the first stop on our short list of decorated caves. 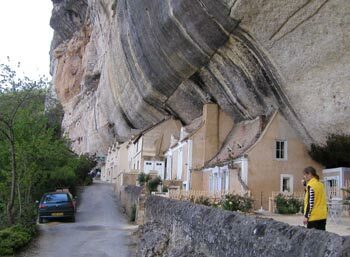 The Grotte is about 6 miles out of Les Eyzies de Tayac (“le-zees-da-tac”), a touristy village in the thick of the decorated cave region. Bill guided us along poorly marked roads in the rolling countryside and finally deposited us at the cave’s entrance at a remote site on an unlikely looking, dead-end road. Rouffignac’s limestone cave network extends more than 6 miles and tourists visit a small section of it by riding in open train cars like those at an old amusement park. Unfortunately, no photos were allowed here or at any of the other caves we visited. Our first Rouffignac “wow” was seeing a series of large, adjacent, tub-like depressions in the reddish cave floor sediment that we later learned had been made by hibernating bears. They were about the dimensions of a bedroom but only about 3’ deep. Though it looked like colonies of bears came in and bedded down at a time, they are actually the product of 1 bear hibernating at a time in a process that was repeated over thousands or tens of thousands of years, perhaps dating back 100,000 years. The parts of Rouffignac that we visited were spacious, with most of the galleries being big enough in diameter to hold a small house. The passageways were like small streets and the cave’s recent history is as a dry cave, as there were stalactites and stalagmites only in a few isolated areas. The walls were unlike any we’ve seen before as the several foot thick layers of mostly homogenous, finely grained limestone were periodically interrupted by thinner, lumpy layers. The lumpy layers held fist-sized and larger pieces of flint nodules. Unlike those reassuring giant, homogenous basalt layers in the Columbia Gorge that are my idea of “rock,” flint often occurs as discreet nodules and here they were present by the thousands. More Rouffignac mammoths captured from a photo. Each decorated cave has its own artistic emphasis and Rouffignac’s is mammoths, of which it has 158. We only saw a handful of these etched depictions, but they were stunning. Some of the most amazing art to me is that that communicates a lot with a little and Rouffignac’s animals are in that category. Seemingly a few strokes etched with a flint tool sensitively represent the profile of a mammoth with its twin tusks, long trunk, shaggy coat, and expressive eye. 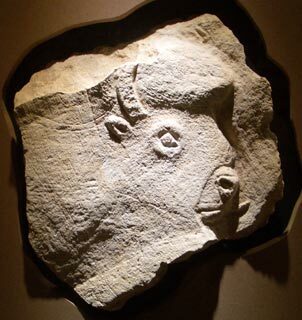 Almost all the animals are shown in profile; with some now only being etchings in the limestone made with a flint tool and others are outlined in black. Only a few are still painted, though many were likely colorfully painted when they were crafted. One of the startling details here and at the other caves was the use of perspective, with a realistic depiction of 1 leg or tusk slightly in front of the other to indicate depth. This cave’s artists were working around 11,000 bce and were using perspective, a representational technique that wasn’t extensively used again until the Renaissance in the 15th century. The fact that perspective was used from the first examples of art, even at the much older caves, had us chattering for days. Rouffignac isn’t a spectacular cave in that its art lacks the drama afforded by the extensive remaining color in the better known Lascaux and Altamira caves, but at least at Rouffignac we were seeing the real thing and not a replica as at the later two. We were pleased to leave Rouffignac with the excitement about the cave art that we had hoped would have been sparked in our Bordeaux and Perigueaux museum visits. top. We planned to stay in the small town several nights to visit 4 more archeological sites and a highly rated museum with finds from the area’s caves and rock shelters. This was to be centerpiece of our decorated cave tour. But “Oh those French!” they do try our patience. It was challenging enough to sort through and allow for the discrepancies the various time schedules in our assorted free and purchased references materials for each of the sites, but then there are all of the unexplained exceptions. Our guide book indicated that one major site in the area, the Grotte de Font Gaume, was closed on Tuesdays during part of the year and Wednesdays other times of the year, which seemed odd. But when we arrived, we discovered that they were now closed on Saturdays instead. And I was sure we’d get to see a small site that has only 1 item: a one-of-a-kind, large bas relief salmon at Abri du Poisson. It was listed in the town’s tourist office’s literature as being open 7 days a week. But when we got there on Tuesday we discovered that alas, it can only be viewed on Mondays and by reservation only. We had so little trust in the process at this point that we decided against making a special trip back to the area on the following Monday to see the huge salmon carved in limestone. We were surprised to see that at L’Abri Pataud, an excavated rock shelter with a tiny museum, was only open 3 days of the week. We were in luck though as we were there on one of the open days. But wait, sign the door said all of the visits for the day were full. Of course, the rub was that it wasn’t a site where you could make reservations, which left us wondering how it could be full. We were lucky in that the next day was the third of its 3 open days for the week but we had little confidence that there wouldn’t be some other exception the next day. An English-speaking Frenchman shook his head and muttered something akin to our “Oh, those French!” when we told him our story the next morning as we all waited, hoping to get inside the door to the site. To our collective relief, we were able to see the shelter remains that day. The reservation system for seeing some of the caves also drove us nuts. Our guide book recommended phoning a few days in advance for Font Gaume but when we called we were told that the next reservation was a week away. They mentioned that we could be at the door when they opened in the morning and perhaps could get a time slot that way. Once there, we were suspicious that perhaps they only made reservations for a week or more in advance though never saw or heard anything to confirm that. The reservations are for a good cause, which is limiting the damage to the caves by limiting the number of people, yet it is clearly a goofy system. There indeed were slots available for the next day, there is no process for filling in “no show” slots during the day and they clearly aren’t up-front with their reservation policies. Our frustration in trying to see the sights in the area was topped off by discovering that the much acclaimed museum with finds from the area’s caves was closed for renovations. After seeing the regrettable museum in Perigueaux , we were more sympathetic that it may have been in desperate need of renovation, but still were sorry to have missed out. The museum is slatted to reopen in the summer, though no opening date was yet available. We’ll hope to catch the museum some other year and have put it on our growing “Next Time” list for France. It was at this point that we decided not to track down another half dozen sites scattered about in southern France that we had considered seeing. The prehistory museums had been disappointing for one reason or another and the information about the caves too scant and unreliable for us to dedicate an additional month traveling to them. Instead, we’d stick to the sites within a few days biking radius of Les Eyzies. One morning we played Round 2 in the reservations game by biking to Grotte de Font Gaume in a downpour 40 minutes before they opened and stood in the rain with a half dozen other hopefuls. The ease with which we were able to get tickets for a starting time in a half hour further diminished the credibility of their reservation system that said they were fully booked, but at least we got in. And we were both horrified and pleased to discover that this was also the only place to buy tickets for a second site we planned to see—thank goodness we didn’t try to see it first. 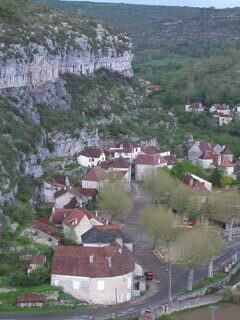 Like Rouffignac, Grotte de Font Gaume is a mostly dry limestone cave but unlike Rouffignac, it is a cave of very narrow corridors. The closeness of Grotte de Font Gaume made it feel like we were walking through the passageways on an old train whereas in Rouffignac we traversed the cave in a small train. We walked a serpentine course, occasionally ducking or turning sideways to avoid contacting the delicate limestone surfaces. At times we could look up and see the narrow slit of the ceiling 50’ or more above us. Font Gaume is the home of bison, not the mammoths of Rouffignac, which is only a few miles away. Here we saw some 3’ long bison filled in with a brown pigment made from mixing the 2 available mineral-based colors: black and red. These bison were also done in profile, with their long tails slightly arched away from their hindquarters, heads down, and exaggerated humps. As with most of the art we saw, the compelling eyes of the animals were still visible, either in color or deeply etched in the stone. Color was often applied on top of the engravings and the natural relief of the cave’s surface was skillfully used to reflect volume, especially in the torso of the animals. In addition to etched and painted bison, there were 2 facing reindeer, 1 kneeling while being licked on the top of its head by the second reindeer; a rhinoceros; a feline, and several horses. Some were quite clear and distinct and others were hazy from the superficial coating of leached calcite. An animal’s lifted hoof was sometimes used to depict motion. The French speaking guide was careful to demonstrate that the concave depressions in the cave walls, when colored just right, look convex in a torch light. The prehistoric artist’s used this technic to create a sense of volume and dimensionality in their animals. Interestingly, harsh electric lights don’t as readily create this illusion of concave surfaces looking like they are convex as did the prehistoric artist’s tallow lamps. Our last cave visit in the Les Eyzies de Tayac area in the Vézère Valley was Les Combarelles. It is quite humble in comparison to the other caves, as was reflected in us being 2 of the only 4 guests in our reserved time slot. It clearly doesn’t have the drawing power of the other sites but we appreciated the breadth it added to our prehistoric art experience. Combarelles is closer to the river’s elevation than the other caves, which may be why it is by far the dampest of the 3 caves we visited in the area. We thanked our Gore-tex hats that we now always wear into caves as they repelled the occasional slimy drips of water leaking from the cave ceiling. And unfortunately, the wetness that’s been in this cave since the climate change some 10,000 years ago has leached out all of the color from the art work--only the etchings remain. At first glance, the wall decorations of the very narrow Combarelles cave are reminiscent of the scarring that grade school kids do to the classroom furniture with their blunt-point paper cutting scissors. The cluttered, overlapping lines and curves look like vandalism at best. Then, with the help of the guide’s flashlight pointer, the outline of a horse or rarer bison or deer emerged from the jumble of lines. Over and over again clear images seem to be lifted out of the disarray with her help. And like all the other caves, the etchings reflected an impressive level of artistic skill. In this cave the artist’s used a curious technic to give a sense of movement, which was showing an animal’s face in profile but depicting its horns in ¾’s view. Like at the other caves, there also were several rare human sketches, all without faces. Like Font Gaume, visiting Combarelles was a walk along a narrow, windy corridor. But unlike at Font Gaume, the Combarelles artists had slithered along on their bellies or on hands and knees rather than walking. Extensive modern excavation (that destroyed precious historical information in the floor layers) allowed us to tour the cave upright like modern bipeds. Modern shelters utilizing the river-carved overhangs. The Abri Pataud site, which curiously is right on the main street of Les Eyzies de Tayac isn’t a cave, but the site of a prehistoric rock shelter. The Magdalenian’s--the cultural group of people at the time of the cave art--didn’t live near the decorated cave surfaces deep in the ground. Instead, they lived in the entrances to the caves or under the overhangs of rock carved by the river. Abri Pataud is one of many of those ancient rock shelter living sites that have been discovered along the rivers in the Dordogne area. Here we only saw to 2 examples of art: a replica of a small bas relief Venus found at the site and an ibex etched in the ceiling. The bulk of the visit was spent seeing the excavation site. Unlike the caves that were discovered and quickly opened to the public in the around the turn of the 20th century, most of Abri Pataud was studied more recently and more meticulously. The 30’ thick sediment floor was a jumble of living debris, like animal bones and tools, layered with chunks of the rock overhang that periodically fell off the ceiling. For us, Abri Pataud wasn’t interesting enough in its own right to be a trip destination but we were happy to see it as it did broaden our understanding of life in the Magdalenian times. And we have certainly learned that the cumulative effect of even modest sights like this can be potent. Abri Pataud also topped off our unpleasant experiences with the French guides at the caves. Amazingly, all of the guides spoke good English but the tours were always in French only, even if half of the group were English speakers, which usually was the case. With such a steady stream of English-speaking visitors even in the low season, it was hard to imagine why some of the tours each hour weren’t in English. At Abri Pataud the guide did give the Anglo’s a quick summary at the end of the tour but her responses to the several questions asked felt like we were being mocked by a bratty adolescent—so rude and so uncalled for. But our luck with tours was about to take a turn for the better. We packed our panniers and headed out of town to see our scattered, last 3 sites. The first stop, Cap Blanc, wasn’t exactly on the way but it was only about 4 miles out of Les Eyzies de Tayac. Cap Blanc, like Abri Pataud, was a Magdalenian rock shelter. But unlike Abri Pataud, you go to Cap Blanc to see the art, not, the dining room rubble. Again, no photos were allowed, but we have included 2 bas relief's snapped by Bill in a Paris museum that reflect the caliber of the work at Cap Blanc (on the first day using his new camera). Cap Blanc’s art is dazzling and was definitely worth the detour and 2 hour wait for it to reopen after the lunch break. It’s a 40’ long, high relief limestone frieze of mostly horses along the back wall of the rock shelter. 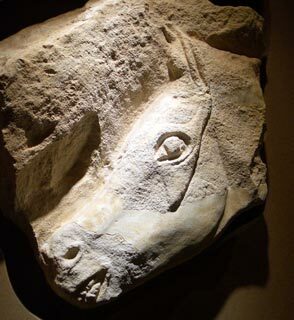 Some of the horses are life-sized and are practically popping out of the wall as the carvings are up to 2’ in depth. The carvings are all at one level along a rock shelter. When it was discovered, there was red ochre coloring on some of the horses but this applied coating was lost in the overly ambitious cleaning process. Nothing else like this impressive frieze has been discovered from this period, either inside a cave or a shelter. We wondered if these stunning carvings were ‘living room art’ as unlike the cave paintings, they are on the back wall of the living area in the naturally formed, outdoor shelter. Most of the large expanses of art surviving from the Magdalenian period were deep in caves. Perhaps the process of carving it filled the need for something to do on those cold, rainy afternoons when the chores were done. Or perhaps it was a practice area for a cave painter. Whatever the motivation, it sure put our living room art to shame. A bonus for us at Cap Blanc was that the staff person there immediately issued us an English description of the frieze so we could follow along as she used her flashlight to highlight the sometimes overlapping carved images. Much to our surprise, our laminated handouts glowed under the black lights in the back of the now enclosed shelter so we could even read when the overhead lights were dimmed during the descriptions. This wonderful bit of customer service was in contrast to how they were staffing the site. It is posted as being open 6 hours a day but the 1 staff person disappeared after 45 minutes and left a sign saying she’d return in another 45 minutes. We had lingered too long at a display case and missed our opportunity that hour to buy postcards of the site. They are apparently only really open half of the time in that 6 hour period. After leaving Cap Blanc, we headed upstream along the Vézère River to see Lascaux, or more properly, Lascaux II. Like Altamira in northern Spain, Lascaux cave is now closed to the public to slow the rate of deterioration and a replica of part of it is available for viewing. At both sites we were surprised that photos were not allowed even though they are replicas and not the original art (though we have one shot here from a museum replica). As in the Les Eyzies area, our visit at Lascaux got off to a difficult start, though for different reasons. A Lascaux II staff person was being intractably “French” in wanting us to park our bikes out on the road with nothing to lock them to, which always makes these people look like they are in cahoots with the local bike thieves. He refused to let us tuck our bikes behind a bench in a sheltered area and chased us off from our second selection as well. He was still fuming but finally relented as we locked our bikes to one of the many little oak trees in the forested area. An example of some of the least-elegant art at Lascaux. The unexpected pleasure of an English speaking guide who actually shared her English with us did a lot to smooth out our ruffled feathers over parking the bikes and we enjoyed our visit to the replica cave. Lascaux II is stunning with its red, brown and black bison and other animals densely covering the walls and ceilings since about 18,000 bce. Lascaux is like the other caves in that there are many animals realistically depicted and very few humans who are always more abstract. Like the other caves, the artists here used perspective and the natural contours of the cave to increase the sense of dimensionality. If a person is only going to see one cave in the area, Lascaux II is certainly the one to see as it is by far the most dramatic. But oh my, were we ticked when we came out from our tour to discover the bikes that arrived after us were nicely resting in a shelter like the one we weren’t allowed to use. We stood in the downpour putting on our rain-soaked helmets and shoes and looked longingly at the other bikes and gear that were still nice and dry. Of course we’ll never know the story behind that picture but we wondered: Were they graciously given the privilege because they were French and not foreigners? Was it because there were more of them? Did they do a better job of deflecting and ignoring the irritating man? Did they manage to park and escape his notice? Whatever the cause of the double standard, the experience did nothing to make us feel better about the French manner. These kinds of experiences with hostile guides and difficult staff combined with the exceptional nastiness of some of the car drivers make it hard for us to enjoy our stay in France. There are unpleasant people everywhere in the world and everyone has a bad day now and then, but as tourist we are challenged by those aggravations much more often in France than anywhere else. After a lot of hemming and hawing, we finally decided to make the several day detour south to visit the Pech Merle (“pesh-mare-el”) cave outside the village of Cabrerets, which was now to be the last site on our grand tour of Upper Paleolithic art in southern France. (We did however, call ahead for reservations as a way to confirm that they would be open.) Each cave or shelter we visited was quite distinctive from the others and Pech Merle alone stood out as real spectacle just as a cave. It is one of those big cavernous affairs with lots of galleries and stunning stalactites and stalagmites that rightfully elicit “Oooo’s” and “Ahhh’s.” It also had its share of oddities, like a giant tree root that travels the height of the cave to finally anchor in the cave floor. Another curiosity was the little “cave pearls” or marble-sized limestone balls that form by swirling in little limestone hollows only when there is a lot of water seeping into the cave, like when it rains a lot. And we ogled the foot prints in the floor mud that are dated to at least 10,000 years ago, as that is when the entrance to the cave was last sealed off by rock slides. Pech Merle’s cave art is the oldest we saw, as most of it was from about the time of the Venuses, 25,000-20,000 bce. The most memorable piece was a dotted horse outlined in black. But the cave had its share of bison, Rouffignac-like mammoths and stick-figure humans. Pech Merle also had reverse hand prints, which we saw at Altamira and some other caves. These were made by placing an open hand against the cave wall and then spraying a red ochre solution around the hand to capture its outline. The hypothesized technic we’ve seen demonstrated uses 2 hollow bird bones, one that is blown through to create a suction effect that pulls the ochre solution out of a bowl, up the adjacent second bone and splatters it onto the wall. We’ve played around with this technic using drink straws and tap water and managed to sprinkle the bathroom mirror with a little bit of water. It seemed to be “Oregon Week” in the Dordogne region: as we visited the last 2 caves we talked to 5 Oregonians. One old guy standing in line with me to buy tickets for Lascaux cave was traveling alone for a whirlwind week in Europe and is from Sauvie’s Island in Portland. The 2 women ahead of us in line at Lascaux are from Albany and Monroe, Oregon, both south of Portland. And 2 days later we stood at a back road’s intersection and had a long conversation with a couple from Portland traveling on folding “Bike Friday’s” like the one’s we used to own. “Oregon Week” quickly transitioned into “Australian Day” as we chatted with 2 small groups of Australian cyclotourists within an hour of each other the next day (they had yet to meet each other). The first couple was riding a Bike Friday folding tandem that we assumed they picked up while living in Seattle for 5 years. They were in the first weeks of their 3 month tour (her first ever) of France and were reveling in the drizzle and rampant green vegetation. The time spent in Seattle and 4 years of drought in Australia had made them big fans of lush green surroundings and said they’d gladly take the rain that comes with it. Next, we spotted 3 very cheery older Australian men at the end of Week 2 of their 6 week tour of France. They commiserated with us about the rudeness of the French and the disappointment in how unnecessarily difficult traveling is because of the unpleasant attitude of too many of the natives. They were anxious for an update on the international news situation, but our last news was only a little more recent than theirs. One had worrisome information for us, which was that his trip to Iceland was cancelled because all the ferries were already booked for the season. We hoped to get internet access soon to see if “Iceland or Bust” will have to be put on the shelf for another year. Talking with all of these English-speakers really lifted our spirits after all of our disgruntling experiences with the French this last week. It was fun to swap stories about our problems and query each other about bike equipment and routes. One Australian had been advised by his bike mechanic not to bother with disc brakes on his new bike and Bill was quick to explain that he’d never tour without them again (we are still raving about our new bikes and especially the brakes). The most treasured information about touring bikes usually comes from fellow traveler’s on the road as they alone understand the very different demands that touring makes on both the bike and the rider. All of these riders, who are biking from 3 weeks to 3 months, are spending their entire biking vacation in France and almost entirely along the rivers. River riding is easy, pleasant riding and requires less refined equipment to do it in comfort. I am sure the reason we encountered so many cyclotourists these first few days of May is because we were along the flat river roads. It’s not high season and this isn’t a ‘hot’ cycling area, but seasoned riders can spot a good river route on the map. But unlike us, their jaunts over the mountain passes will be by train, rather than pedaling. So, when we climbed the nearly 1000’ out of the river valley to work our way north, we knew we’d be severing our contact with this fun little roaming community of bike travelers. But a young Belgium man spending 2 months walking the pilgrim’s route to Santiago de Compostela in Spain eased the separation by gracing us with one last English-speaking traveler’s conversation at the end of the day. And should you ever travel to southern France to visit the caves, our best reference has been a little book I bought at Altamira called “Our Prehistoric Past: Art & Civilization” by Thames & Hudson in their New Horizons series. It is pocket book-sized, about 150 pages and has lots of high quality photos. It is one title in a series of 50 or more on history and artists that seem to primarily be marketed at museum shops. They are for folks like us who are new to the subject but want to know more. The back of the book was as valuable as the front of the book as it has pages of museums listed by countries, lists of where to see the real thing for all of the photos shown, a list of the decorated caves of Europe, and a glossary. We poured over it as much as we did the maps and guide books when figuring out where to go next on our decorated cave tour. We arrived in the Normandy region of northwestern France yesterday and will be visiting the D-Day beaches and its museums in a few days. We expect to conclude this year's tour of France by crossing the English Channel about July 1.